1. 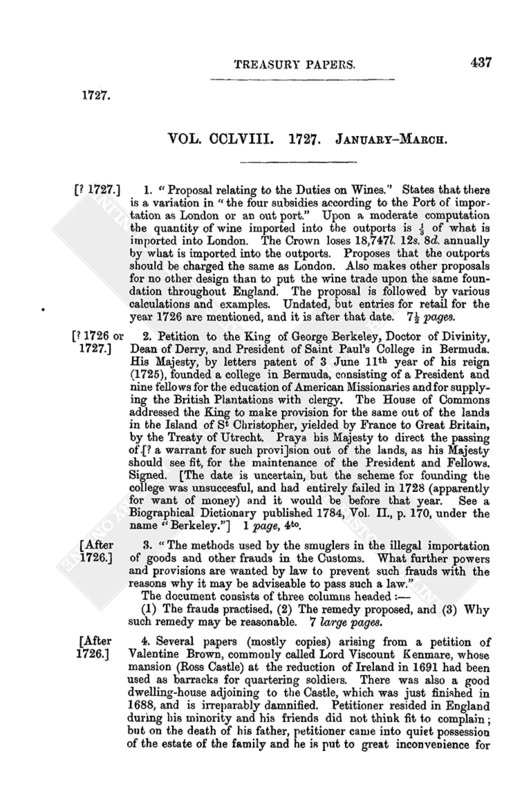 “Proposal relating to the Duties on Wines.” States that there is a variation in “the four subsidies according to the Port of importation as London or an out port.” Upon a moderate computation the quantity of wine imported into the outports is ⅓ of what is imported into London. The Crown loses 18,747l. 12s. 8d. annually by what is imported into the outports. Proposes that the outports should be charged the same as London. Also makes other proposals for no other design than to put the wine trade upon the same foundation throughout England. The proposal is followed by various calculations and examples. Undated, but entries for retail for the year 1726 are mentioned, and it is after that date. 7½ pages. 2. Petition to the King of George Berkeley, Doctor of Divinity, Dean of Derry, and President of Saint Paul's College in Bermuda. His Majesty, by letters patent of 3 June 11th year of his reign (1725), founded a college in Bermuda, consisting of a President and nine fellows for the education of American Missionaries and for supplying the British Plantations with clergy. The House of Commons addressed the King to make provision for the same out of the lands in the Island of St Christopher, yielded by France to Great Britain, by the Treaty of Utrecht. Prays his Majesty to direct the passing of [? a warrant for such provi]sion out of the lands, as his Majesty should see fit, for the maintenance of the President and Fellows. Signed. [The date is uncertain, but the scheme for founding the college was unsuccesful, and had entirely failed in 1728 (apparently for want of money) and it would be before that year. See a Biographical Dictionary published 1784, Vol. II., p. 170, under the name “Berkeley.”] 1 page, 4to. (1) The frauds practised, (2) The remedy proposed, and (3) Why such remedy may be reasonable. 7 large pages. 4. 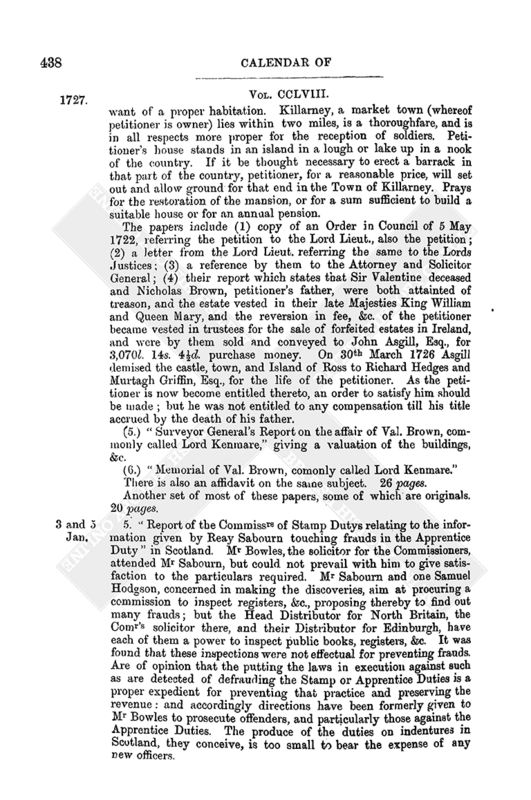 Several papers (mostly copies) arising from a petition of Valentine Brown, commonly called Lord Viscount Kenmare, whose mansion (Ross Castle) at the reduction of Ireland in 1691 had been used as barracks for quartering soldiers. There was also a good dwelling-house adjoining to the Castle, which was just finished in 1688, and is irreparably damnified. Petitioner resided in England during his minority and his friends did not think fit to complain; but on the death of his father, petitioner came into quiet possession of the estate of the family and he is put to great inconvenience for want of a proper habitation. Killarney, a market town (whereof petitioner is owner) lies within two miles, is a thoroughfare, and is in all respects more proper for the reception of soldiers. Petitioner's house stands in an island in a lough or lake up in a nook of the country. If it be thought necessary to erect a barrack in that part of the country, petitioner, for a reasonable price, will set out and allow ground for that end in the Town of Killarney. Prays for the restoration of the mansion, or for a sum sufficient to build a suitable house or for an annual pension. The papers include (1) copy of an Order in Council of 5 May 1722, referring the petition to the Lord Lieut., also the petition; (2) a letter from the Lord Lieut. referring the same to the Lords Justices; (3) a reference by them to the Attorney and Solicitor General; (4) their report which states that Sir Valentine deceased and Nicholas Brown, petitioner's father, were both attainted of treason, and the estate vested in their late Majesties King William and Queen Mary, and the reversion in fee, &c. of the petitioner became vested in trustees for the sale of forfeited estates in Ireland, and were by them sold and conveyed to John Asgill, Esq., for 3,070l. 14s. 4½d. purchase money. On 30th March 1726 Asgill demised the castle, town, and Island of Ross to Richard Hedges and Murtagh Griffin, Esq., for the life of the petitioner. As the petitioner is now become entitled thereto, an order to satisfy him should be made; but he was not entitled to any compensation till his title accrued by the death of his father. (5.) “Surveyor General's Report on the affair of Val. Brown, commonly called Lord Kenmare,” giving a valuation of the buildings, &c.
There is also an affidavit on the same subject. 26 pages. Another set of most of these papers, some of which are originals. 20 pages. 5. “Report of the Commissrs of Stamp Dutys relating to the information given by Reay Sabourn touching frauds in the Apprentice Duty” in Scotland. Mr Bowles, the solicitor for the Commissioners, attended Mr Sabourn, but could not prevail with him to give satisfaction to the particulars required. Mr Sabourn and one Samuel Hodgson, concerned in making the discoveries, aim at procuring a commission to inspect registers, &c., proposing thereby to find out many frauds; but the Head Distributor for North Britain, the Comr's solicitor there, and their Distributor for Edinburgh, have each of them a power to inspect public books, registers, &c. It was found that these inspections were not effectual for preventing frauds. 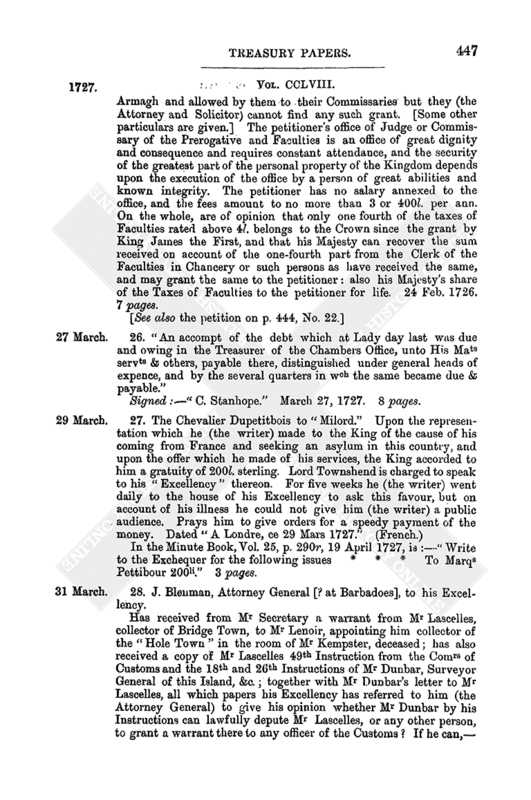 Are of opinion that the putting the laws in execution against such as are detected of defrauding the Stamp or Apprentice Duties is a proper expedient for preventing that practice and preserving the revenue: and accordingly directions have been formerly given to Mr Bowles to prosecute offenders, and particularly those against the Apprentice Duties. The produce of the duties on indentures in Scotland, they conceive, is too small to bear the expense of any new officers. Accompanied by (1) a memorial of Mr Hodgson on the same subject, dated 5 Jan. 1726–7; (2) an interloquitur or sentence of Lord Grange pronounced Decr 21, 1726; and (3) a “scheme” referred to in the memorial. 5 pages. 6. Report of the Surveyor General (Philip Gybbon) to the Lords of the Treasury, on the representation of Mr Evan Lloyd, who offered to become the purchaser of the right of the Crown to the Estate of Mr Morgan Whitley, formerly Receiver General of Taxes for Chester and North Wales, who died greatly indebted to the Crown, against whom an extent issued in A.D. 1700. By Inquisition he was found seised in fee of an Estate called Parkey, in the co. of Denbigh. Several levaris have since issued to which no returns have been made. Has perused the Inquisition whereby it is found that Morgan Whitley was seized in fee of a capital messuage called Plas Dio [commonly called Parkey] with appurtenances in Bedwall, Pickhill, and Abingburg Vaur, in the co. of Denbigh, containing 50 acres of arable land, 20 acres of meadow, and 50 of pasture or thereabouts of the annual value of 40l. The original debt of the Receiver was 45,007l. 19s. 11½d., and there has since been paid into the Exchequer 14,342l. 9s., and 18,208l. 11s. 3d. was thought by the Comrs and Agents for Taxes reasonable to be allowed him on his several cravings. In an affidavit referred to, the Estate is estimated to be of the annual value of 40l. Lands in Denbighshire are estimated to sell for at least twenty years' purchase. The Comrs and Agents for Taxes observe that all estates of Receivers, seized as aforesaid, have been usually sold before the King's Remembrancer, and the money paid into the Exchequer and applied to the proper aids. 9 Jan. 1726. The representation referred to. 4 pages. 7. 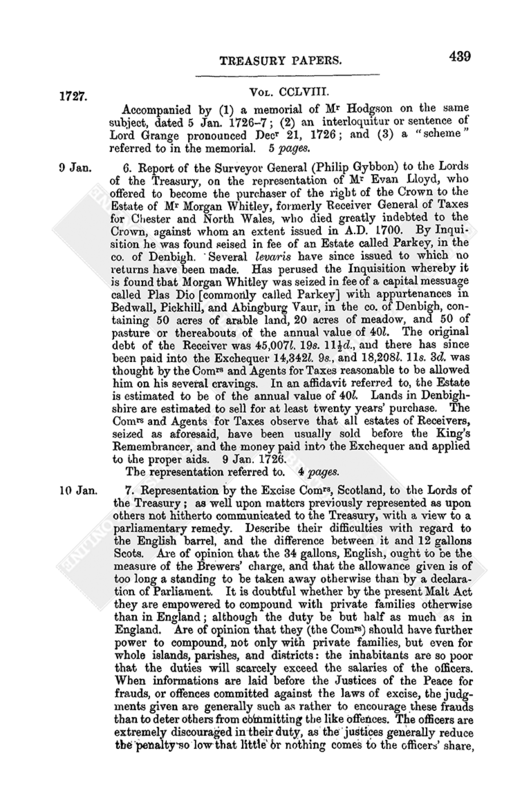 Representation by the Excise Comrs, Scotland, to the Lords of the Treasury; as well upon matters previously represented as upon others not hitherto communicated to the Treasury, with a view to a parliamentary remedy. Describe their difficulties with regard to the English barrel, and the difference between it and 12 gallons Scots. Are of opinion that the 34 gallons, English, ought to be the measure of the Brewers' charge, and that the allowance given is of too long a standing to be taken away otherwise than by a declaration of Parliament. It is doubtful whether by the present Malt Act they are empowered to compound with private families otherwise than in England; although the duty be but half as much as in England. Are of opinion that they (the Comrs) should have further power to compound, not only with private families, but even for whole islands, parishes, and districts: the inhabitants are so poor that the duties will scarcely exceed the salaries of the officers. When informations are laid before the Justices of the Peace for frauds, or offences committed against the laws of excise, the judgments given are generally such as rather to encourage these frauds than to deter others from committing the like offences. The officers are extremely discouraged in their duty, as the justices generally reduce the penalty so low that little or nothing comes to the officers' share, and frequently the Justices acquit the offenders from any penalty, though the proof be never so clear. The remedy has been to prosecute in the Exchequer or some other Court at Edinburgh; but many of the offenders are so poor that the carrying prosecutions through those Courts (where the penalties are never mitigated) would ruin many people, and be very chargeable to the Government, for few of the people would be able to pay the penalties in their full. Would propose a mean between these two extremes by giving them (the Comrs) power to compound for penalties upon the desire made to them by the offenders before the Courts had determined the matter. Refer to frauds in connexion with receipts given under the Act 1 [Geo. I.] for arms surrendered, the persons surrendering the same being entitled to receive the full value of the arms from Collectors of the Land Tax or Excise. Send the clauses which they desire to have added to the Malt Bill or some other Bill. 7 pages. 8. Memorial of Sidney Godolphin, Esq., Auditor of Wales, to the Lords of the Treasury. The Duke and Duchess of Bolton obtained a warrant for the renewal of a lease from the Prince of Wales of the Pre and Post Fines and of the King's silver, &c. within the several counties of South Wales. Their Lordships have lately granted the “same fines” to “one Mr Rock within several counties of North Wales, [and memorialist] was dubious how to act, and had asked their Lordships' directions, but had not yet received their orders: asks directions. 11 Jan. 1726.” 1 page. 9. Proposal signed “W. Edgell” and “Robert Bonell” addressed to the Rt Hon. Sir Robert Walpole for raising 2,500,000l. No interest was to be paid for this annuity but such as should commence from Midsummer 1734 and continue till Midsummer 1755, and be paid (if the nominees so long live) at the rate of 30l. per cent. per annum. The Sinking Fund was to be charged therewith unless the House of Commons provide otherwise. The scheme is set out in figures. 14 Jan. 1726. Accompanied by a letter from them to Chr. Tilson, Esq., on the same subject. 4½ pages. 10. 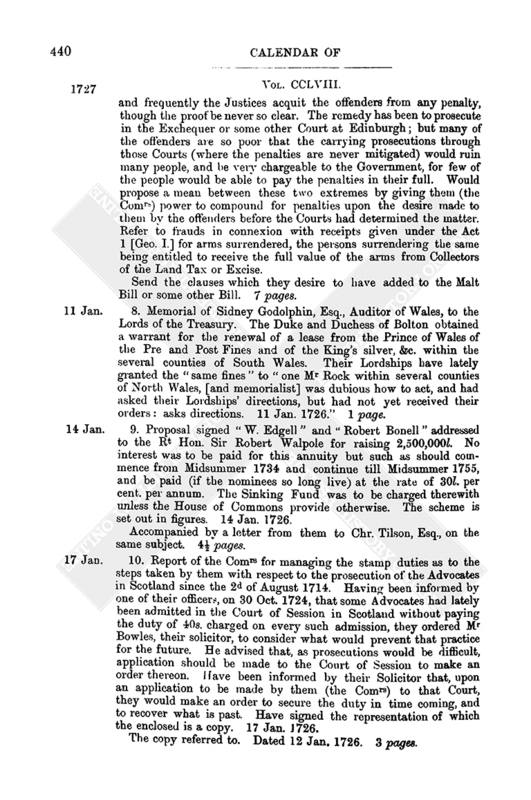 Report of the Comrs for managing the stamp duties as to the steps taken by them with respect to the prosecution of the Advocates in Scotland since the 2d of August 1714. Having been informed by one of their officers, on 30 Oct. 1724, that some Advocates had lately been admitted in the Court of Session in Scotland without paying the duty of 40s. charged on every such admission, they ordered Mr Bowles, their solicitor, to consider what would prevent that practice for the future. He advised that, as prosecutions would be difficult, application should be made to the Court of Session to make an order thereon. Have been informed by their Solicitor that, upon an application to be made by them (the Comrs) to that Court, they would make an order to secure the duty in time coming, and to recover what is past. Have signed the representation of which the enclosed is a copy. 17 Jan. 1726. The copy referred to. Dated 12 Jan. 1726. 3 pages. 11. Thomas Tickell to Mr Secretary Clutterbuck. Has laid before the Lords Justices (Ireland) his letter, enclosing the King's warrant for 335l. 14s. 3¼d., to Lord Shannon, to reimburse him “for so much money paid to the public by his Lordship, on the account of his absence from Ireland in 1720 and 1721.” Their Excellencies being apprehensive lest some observations may be made upon the reciting part of the warrant, when it is produced in the House of Commons, have consulted the Prime Serjeant, and the Attorney and Solicitor General, who have all confirmed their Excellencies in their opinion, that notwithstanding Lord Shannon's reasonable claim and his Majesty's undoubted power to order this money by his Royal letter, yet there was reason to fear it would raise a clamour in the House of Commons. Persons might not be wanting there to construe this, his Majesty's favour, as a virtual exemption of a particular person from paying a public tax, and perhaps they might propose a clause in the next money bill for preventing the like for the future. Proposes, on the part of their Excellencies, that another letter should be obtained without alleging the reasons mentioned in the reciting part of the present warrant. The warrant referred to. 3½ pages. 12. Memorial of the Governor and Court of Assistants of the York Buildings Company, on behalf of themselves and the Company, to the Lords of the Treasury. Have attended the Comrs for the forfeited Estates in Scotland, and represented their claims, supported by the opinion of the Solicitor General and of Mr Fane, their counsel. The Comrs have made up the accounts of the four first estates purchased, and also of Fingash, another estate purchased by the Company, and have drawn them to a balance of 9,734l. 5s. 3½d., without having allowed the Company any consideration for tithes and casual rent of Winton, &c. The Company is overcharged 2,071l. 11s. The Comrs have issued their precepts for 9,734l. 5s. 3½d., being the balance without any allowance, &c. What is of great consequence to the Company is, to have the case of the two years' rent, which was given to such of the Company's servants as remained dutiful to the King, fully considered, and relief given. Are advised that their tenants have good right thereto. In that case the amount must be deducted from the Company's debt due to Government. 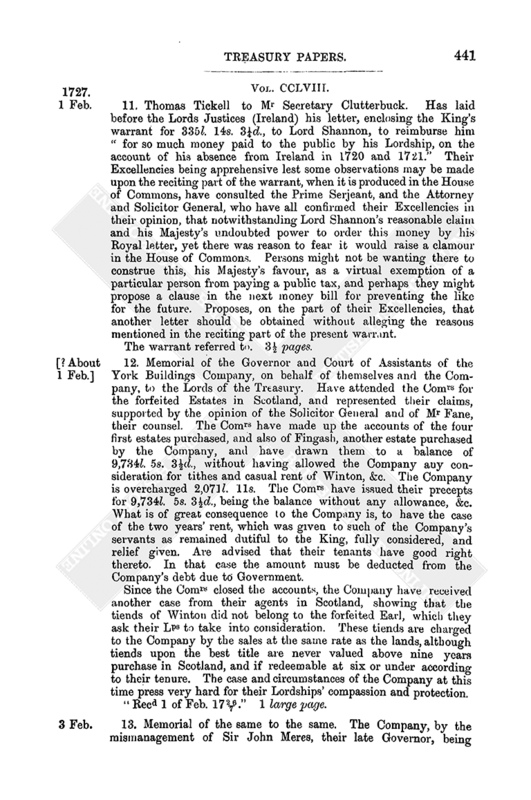 Since the Comrs closed the accounts, the Company have received another case from their agents in Scotland, showing that the tiends of Winton did not belong to the forfeited Earl, which they ask their Lps to take into consideration. These tiends are charged to the Company by the sales at the same rate as the lands, although tiends upon the best title are never valued above nine years purchase in Scotland, and if redeemable at six or under according to their tenure. The case and circumstances of the Company at this time press very hard for their Lordships' compassion and protection. “Recd 1 of Feb. 1726/1727.” 1 large page. 13. Memorial of the same to the same. The Company, by the mismanagement of Sir John Meres, their late Governor, being involved in great debts and difficulties, appointed a Committee to examine into their (the Company's) affairs to discover the unwarrantable measures Sir John had entered into. The Committee have found that he was guilty of a very great breach of trust in misrepresenting in his speeches at the General Courts the true state of the Company's affairs, by altering the minutes of several General Courts some days after they were adjourned, and thereby quite perverting their sense and intention, and by the misapplication of their money. A narrative of which unwarrantable proceedings is annexed. 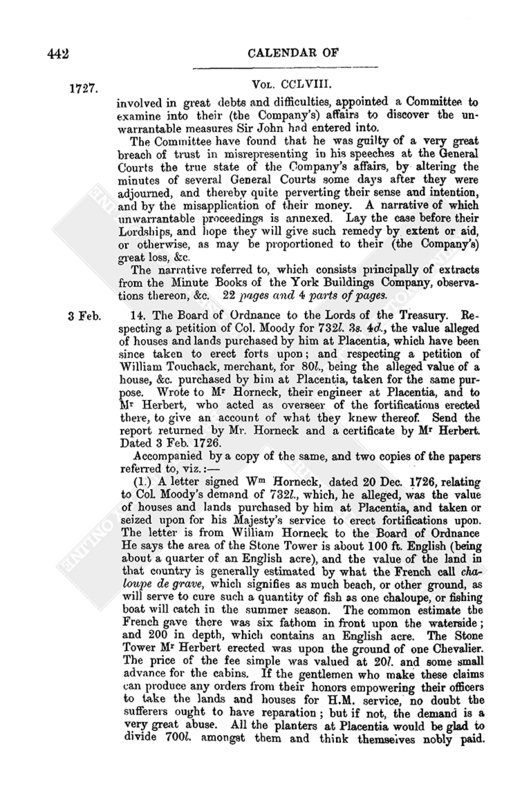 Lay the case before their Lordships, and hope they will give such remedy by extent or aid, or otherwise, as may be proportioned to their (the Company's) great loss, &c.
The narrative referred to, which consists principally of extracts from the Minute Books of the York Buildings Company, observations thereon, &c. 22 pages and 4 parts of pages. 14. The Board of Ordnance to the Lords of the Treasury. Respecting a petition of Col. Moody for 732l. 3s. 4d., the value alleged of houses and lands purchased by him at Placentia, which have been since taken to erect forts upon; and respecting a petition of William Touchack, merchant, for 80l., being the alleged value of a house, &c. purchased by him at Placentia, taken for the same purpose. Wrote to Mr Horneck, their engineer at Placentia, and to Mr Herbert, who acted as overseer of the fortifications erected there, to give an account of what they knew thereof. Send the report returned by Mr. Horneck and a certificate by Mr Herbert. Dated 3 Feb. 1726. (1.) A letter signed Wm Horneck, dated 20 Dec. 1726, relating to Col. Moody's demand of 732l., which, he alleged, was the value of houses and lands purchased by him at Placentia, and taken or seized upon for his Majesty's service to erect fortifications upon. The letter is from William Horneck to the Board of Ordnance He says the area of the Stone Tower is about 100 ft. English (being about a quarter of an English acre), and the value of the land in that country is generally estimated by what the French call chaloupe de grave, which signifies as much beach, or other ground, as will serve to cure such a quantity of fish as one chaloupe, or fishing boat will catch in the summer season. The common estimate the French gave there was six fathom in front upon the waterside; and 200 in depth, which contains an English acre. The Stone Tower Mr Herbert erected was upon the ground of one Chevalier. The price of the fee simple was valued at 20l. and some small advance for the cabins. If the gentlemen who make these claims can produce any orders from their honors empowering their officers to take the lands and houses for H.M. service, no doubt the sufferers ought to have reparation; but if not, the demand is a very great abuse. All the planters at Placentia would be glad to divide 700l. amongst them and think themselves nobly paid. When he (the writer) lived there these houses and lands, represented as of vast consequence, were pulled down by the soldiers and inhabitants, as things abandoned, and Col. Moody gave them to any one who would possess them. He (the writer) and the officers refused to accept the possession of what has lately arisen to so great a value. Cannot forbear admiring this gentleman's making them (the Board of Ordnance) the purchasers of his land thirteen years after he was willing to give them away for nothing. If Col. Gledhill has taken away the possession of any of these gentlemen, he ought to be regularly sued at law for the same, as other Governors of plantations have been. (2.) The certificate of Humphrey Herbert, who valued the cabin which he took down occupied by Mr William Touchack at about 12l. or 14l. 13 pages. 15. 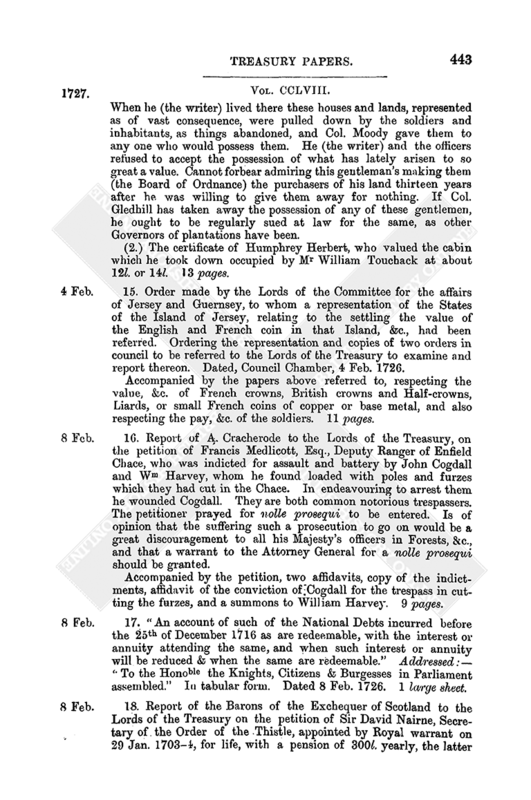 Order made by the Lords of the Committee for the affairs of Jersey and Guernsey, to whom a representation of the States of the Island of Jersey, relating to the settling the value of the English and French coin in that Island, &c., had been referred. Ordering the representation and copies of two orders in council to be referred to the Lords of the Treasury to examine and report thereon. Dated, Council Chamber, 4 Feb. 1726. Accompanied by the papers above referred to, respecting the value, &c. of French crowns, British crowns and Half-crowns, Liards, or small French coins of copper or base metal, and also respecting the pay, &c. of the soldiers. 11 pages. 16. 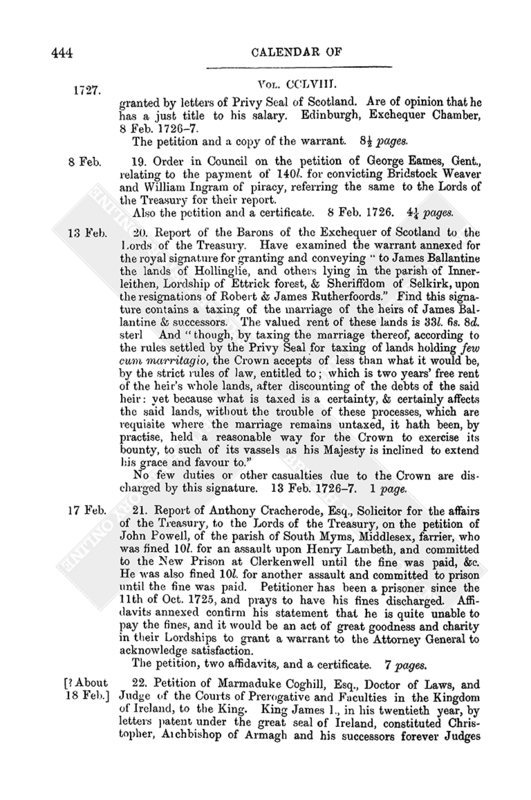 Report of A. Cracherode to the Lords of the Treasury, on the petition of Francis Medlicott, Esq., Deputy Ranger of Enfield Chace, who was indicted for assault and battery by John Cogdall and Wm Harvey, whom he found loaded with poles and furzes which they had cut in the Chace. In endeavouring to arrest them he wounded Cogdall. They are both common notorious trespassers. The petitioner prayed for nolle prosequi to be entered. Is of opinion that the suffering such a prosecution to go on would be a great discouragement to all his Majesty's officers in Forests, &c., and that a warrant to the Attorney General for a nolle prosequi should be granted. Accompanied by the petition, two affidavits, copy of the indictments, affidavit of the conviction of Cogdall for the trespass in cutting the furzes, and a summons to William Harvey. 9 pages. 17. “An account of such of the National Debts incurred before the 25th of December 1716 as are redeemable, with the interest or annuity attending the same, and when such interest or annuity will be reduced & when the same are redeemable.” Addressed:—“To the Honoble the Knights, Citizens & Burgesses in Parliament assembled.” In tabular form. Dated 8 Feb. 1726. 1 large sheet. 18. Report of the Barons of the Exchequer of Scotland to the Lords of the Treasury on the petition of Sir David Nairne, Secretary of the Order of the Thistle, appointed by Royal warrant on 29 Jan. 1703–4, for life, with a pension of 300l. yearly, the latter granted by letters of Privy Seal of Scotland. Are of opinion that he has a just title to his salary. Edinburgh, Exchequer Chamber, 8 Feb. 1726–7. The petition and a copy of the warrant. 8½ pages. 19. 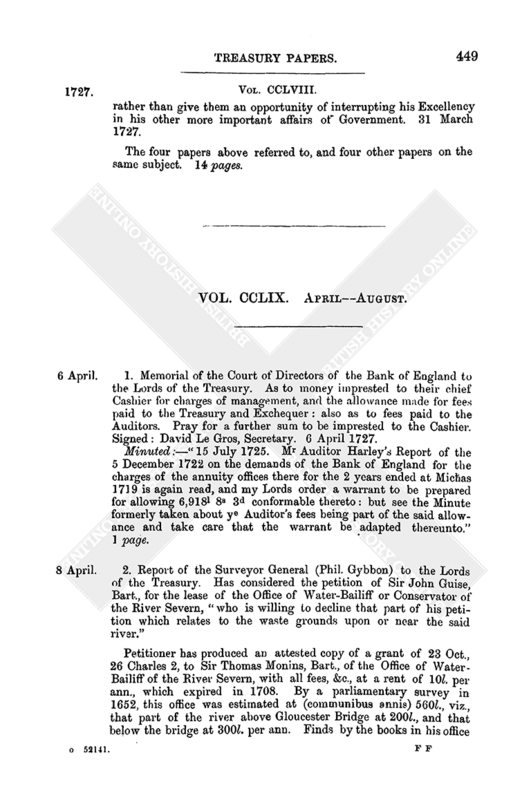 Order in Council on the petition of George Eames, Gent., relating to the payment of 140l. for convicting Bridstock Weaver and William Ingram of piracy, referring the same to the Lords of the Treasury for their report. Also the petition and a certificate. 8 Feb. 1726. 4¼ pages. No few duties or other casualties due to the Crown are discharged by this signature. 13 Feb. 1726–7. 1 page. 21. Report of Anthony Cracherode, Esq., Solicitor for the affairs of the Treasury, to the Lords of the Treasury, on the petition of John Powell, of the parish of South Myms, Middlesex, farrier, who was fined 10l. for an assault upon Henry Lambeth, and committed to the New Prison at Clerkenwell until the fine was paid, &c. He was also fined 10l. for another assault and committed to prison until the fine was paid. Petitioner has been a prisoner since the 11th of Oct. 1725, and prays to have his fines discharged. Affidavits annexed confirm his statement that he is quite unable to pay the fines, and it would be an act of great goodness and charity in their Lordships to grant a warrant to the Attorney General to acknowledge satisfaction. The petition, two affidavits, and a certificate. 7 pages. 22. 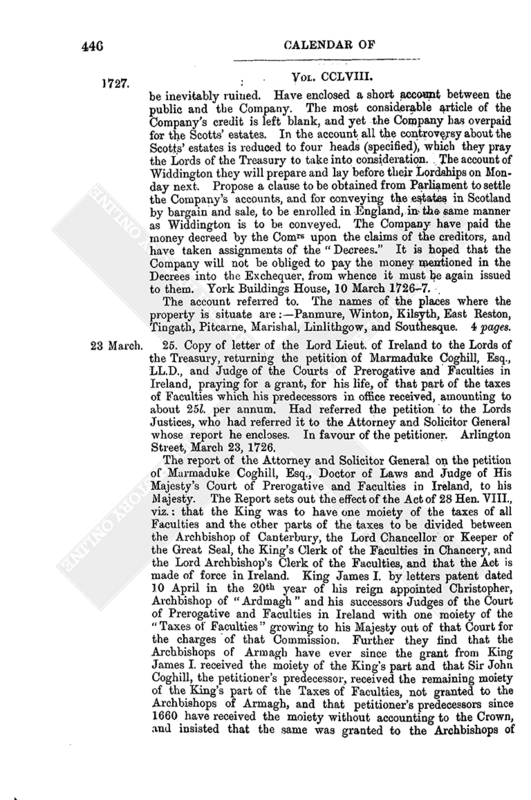 Petition of Marmaduke Coghill, Esq., Doctor of Laws, and Judge of the Courts of Prerogative and Faculties in the Kingdom of Ireland, to the King. King James 1., in his twentieth year, by letters patent under the great seal of Ireland, constituted Christopher, Archbishop of Armagh and his successors forever Judges or Presidents of the courts above named, with power to appoint any person to execute the office. The King also granted to the Archbishop, for the execution of the office, one moiety of the taxes of Faculties. Michael, Archbishop of Armagh, on 13 June 1699, appointed petitioner as his substitute, and granted him all the fees due. The King is entitled to a moiety of the taxes of all faculties, which moiety (as was conceived) was granted by King James to the Archbishop and his successors. All other fees, except the moiety of the King's moiety, were granted by the Archbishop to petitioner, in like manner as to his predecessors; and the Archbishops have always received a moiety of the moiety of the King's part, and the predecessors of petitioner have received the other moiety. Soon after petitioner was constituted Commissary of the Courts, the moiety of the King's part of the Taxes of Faculties was demanded of petitioner by the Clerk of the Faculties, he alleging that only a moiety of the King's moiety was granted to the Archbishop, and not the whole moiety: and petitioner being unwilling to have a suit with the Crown, paid into the Exchequer, not only what he had received, but also what his father, Sir John Coghill, had received when Commissary; and the King's moiety or proportion of the taxes of Faculties has ever since been paid to the Clerk of the Faculties in Chancery. The office of Commissary of the Courts, or Substitute of his Majesty's Courts of Prerogative and Faculties, is of great consequence and dignity; but no salary or allowance has been settled for its support, except the fees and perquisites, which are so small that they will not support the petitioner. Prays for a grant for life of that part of the taxes of Faculties which was received by his predecessors, amounting to about 25l. per annum, and that all the sums paid to the Clerk of the Faculties, since petitioner was made Commissary, may be repaid to him. Two affidavits in support of the petition. Also a certificate, dated 18 Feb. 1726, from the Deputy Auditor General that upon search made in his office he does not find any account passed of the Clerk of the Faculties since the year 1700. 4¾ pages. 23. Return to Parliament indorsed:—“An accot of the gross produce of the severall branches of the Civil List revenues with all deductions for charges of management or any other accot whatsoever before the same was paid into the Exchequer. With an accot of the net produce paid in by the severall officers from ye 1st day of Augt 1714 to Micħas. 1725: distinguishing each year. Stated from the accot thereof collected from the proper offices and herewith delivered into this Honoble House under the numbers 1, 2, 3, 4, 5, 6, 7, 8.” The paper is signed “M. Frecker,” and dated 22 Feb. 1726–7. There is also a duplicate of the first page with some little variation. 4 pages. 24. The Governor and Assistants of the York Buildings Company to J. Scrope, Esq. If they do not find relief at this time, they will be inevitably ruined. Have enclosed a short account between the public and the Company. The most considerable article of the Company's credit is left blank, and yet the Company has overpaid for the Scotts' estates. In the account all the controversy about the Scotts' estates is reduced to four heads (specified), which they pray the Lords of the Treasury to take into consideration. The account of Widdington they will prepare and lay before their Lordships on Monday next. Propose a clause to be obtained from Parliament to settle the Company's accounts, and for conveying the estates in Scotland by bargain and sale, to be enrolled in England, in the same manner as Widdington is to be conveyed. The Company have paid the money decreed by the Comrs upon the claims of the creditors, and have taken assignments of the “Decrees.” It is hoped that the Company will not be obliged to pay the money mentioned in the Decrees into the Exchequer, from whence it must be again issued to them. York Buildings House, 10 March 1726–7. The account referred to. The names of the places where the property is situate are:—Panmure, Winton, Kilsyth, East Reston, Tingath, Pitcarne, Marishal, Linlithgow, and Southesque. 4 pages. 25. Copy of letter of the Lord Lieut. of Ireland to the Lords of the Treasury, returning the petition of Marmaduke Coghill, Esq., LL.D., and Judge of the Courts of Prerogative and Faculties in Ireland, praying for a grant, for his life, of that part of the taxes of Faculties which his predecessors in office received, amounting to about 25l. per annum. Had referred the petition to the Lords Justices, who had referred it to the Attorney and Solicitor General whose report he encloses. In favour of the petitioner. Arlington Street, March 23, 1726. The report of the Attorney and Solicitor General on the petition of Marmaduke Coghill, Esq., Doctor of Laws and Judge of His Majesty's Court of Prerogative and Faculties in Ireland, to his Majesty. The Report sets out the effect of the Act of 28 Hen. VIII., viz. : that the King was to have one moiety of the taxes of all Faculties and the other parts of the taxes to be divided between the Archbishop of Canterbury, the Lord Chancellor or Keeper of the Great Seal, the King's Clerk of the Faculties in Chancery, and the Lord Archbishop's Clerk of the Faculties, and that the Act is made of force in Ireland. King James I. by letters patent dated 10 April in the 20th year of his reign appointed Christopher, Archbishop of “Ardmagh” and his successors Judges of the Court of Prerogative and Faculties in Ireland with one moiety of the “Taxes of Faculties” growing to his Majesty out of that Court for the charges of that Commission. 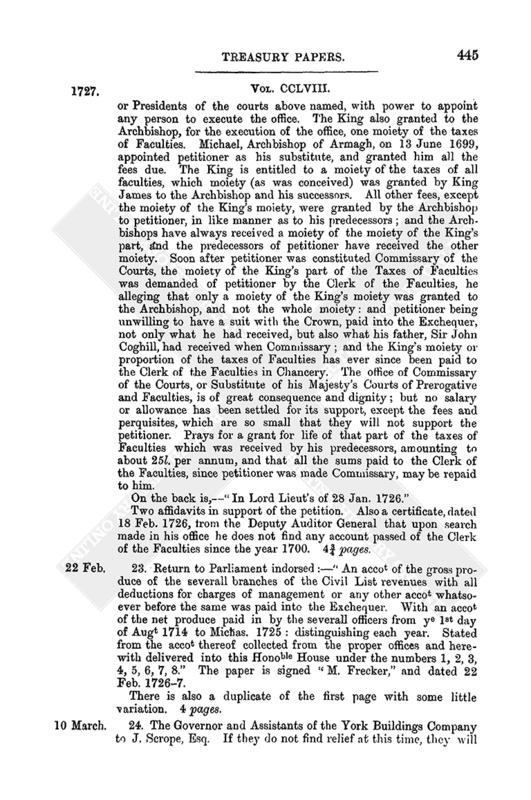 Further they find that the Archbishops of Armagh have ever since the grant from King James I. received the moiety of the King's part and that Sir John Coghill, the petitioner's predecessor, received the remaining moiety of the King's part of the Taxes of Faculties, not granted to the Archbishops of Armagh, and that petitioner's predecessors since 1660 have received the moiety without accounting to the Crown, and insisted that the same was granted to the Archbishops of Armagh and allowed by them to their Commissaries but they (the Attorney and Solicitor) cannot find any such grant. [Some other particulars are given.] The petitioner's office of Judge or Commissary of the Prerogative and Faculties is an office of great dignity and consequence and requires constant attendance, and the security of the greatest part of the personal property of the Kingdom depends upon the execution of the office by a person of great abilities and known integrity. The petitioner has no salary annexed to the office, and the fees amount to no more than 3 or 400l. per ann. On the whole, are of opinion that only one fourth of the taxes of Faculties rated above 4l. belongs to the Crown since the grant by King James the First, and that his Majesty can recover the sum received on account of the one-fourth part from the Clerk of the Faculties in Chancery or such persons as have received the same, and may grant the same to the petitioner: also his Majesty's share of the Taxes of Faculties to the petitioner for life. 24 Feb. 1726. 7 pages. Signed:—“C. Stanhope.” March 27, 1727. 8 pages. In the Minute Book, Vol. 25, p. 290r, 19 April 1727, is:—“Write to the Exchequer for the following issues * * * To Marqs Pettibour 200li.” 3 pages. 28. J. Blenman, Attorney General [? at Barbadoes], to his Excellency. Has received from Mr Secretary a warrant from Mr Lascelles, collector of Bridge Town, to Mr Lenoir, appointing him collector of the “Hole Town” in the room of Mr Kempster, deceased; has also received a copy of Mr Lascelles 49th Instruction from the Comrs of Customs and the 18th and 26th Instructions of Mr Dunbar, Surveyor General of this Island, &c.; together with Mr Dunbar's letter to Mr Lascelles, all which papers his Excellency has referred to him (the Attorney General) to give his opinion whether Mr Dunbar by his Instructions can lawfully depute Mr Lascelles, or any other person, to grant a warrant there to any officer of the Customs? If he can,— whether it ought not to be done by a deputation and not by a letter? but if he cannot (as there is now an absolute necessity for a collector of the Hole Town), how the post may be filled at present till Mr. Dunbar shall appoint some fit person for it? Has carefully perused the several papers, and observes, previous to answering the question, that he conceives Mr Lascelles's 49th Instruction gives him no power at all in this respect; for the further Instructions he is to receive from the Surveyor General plainly relate only to his duty in his own employment, &c. To come to Mr Dunbar's Instructions, as he has undoubtedly full power in case of death, absence, or suspension of any officer of the Customs to appoint some fit person in his stead, so it is obvious that he has not thereby any express power of delegating the same to another. Takes it that authorities of this kind, which carry with them a trust, ought not to be extended beyond the plain import of the words in which they are expressed, nor is it likely that the Honourable Board would have omitted to give such a power of delegation had they intended it should be practised, &c.
Heretofore there were two Commissioners of the Customs for this Island who always had this power, but afterwards a Surveyor General and a Collector of the Bridge Town were appointed in their room, and these two “Officers,” whilst possessed by Mr Edwards and Mr Perry, who were the first that ever enjoyed them, had, at different times, according to their respective interests at Home, the power now spoken of; but he (the Attorney General) never understood that either of those gentlemen could, or ever did, take upon himself to delegate it to the others. Taking it, therefore, that Mr Dunbar cannot in strictness give Mr Lascelles a power to appoint an officer of the Customs there, especially by letter only, the question will be: How any vacancy shall be supplied in the absence of the Surveyor General? Apprehends this is easily answered, seeing that it cannot be doubted but his Excellency may for his Majesty's service well appoint a person to act in such an office till the gentleman empowered by the Comrs shall be in the way to do it, or till one be appointed from home. 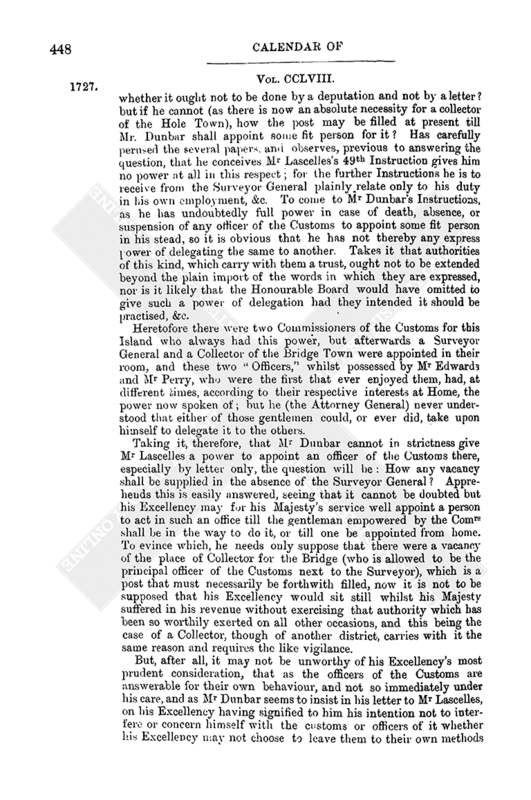 To evince which, he needs only suppose that there were a vacancy of the place of Collector for the Bridge (who is allowed to be the principal officer of the Customs next to the Surveyor), which is a post that must necessarily be forthwith filled, now it is not to be supposed that his Excellency would sit still whilst his Majesty suffered in his revenue without exercising that authority which has been so worthily exerted on all other occasions, and this being the case of a Collector, though of another district, carries with it the same reason and requires the like vigilance. But, after all, it may not be unworthy of his Excellency's most prudent consideration, that as the officers of the Customs are answerable for their own behaviour, and not so immediately under his care, and as Mr Dunbar seems to insist in his letter to Mr Lascelles, on his Excellency having signified to him his intention not to interfere or concern himself with the customs or officers of it whether his Excellency may not choose to leave them to their own methods rather than give them an opportunity of interrupting his Excellency in his other more important affairs of Government. 31 March 1727. The four papers above referred to, and four other papers on the same subject. 14 pages.